If you’ve ever stood before an aisle of wine completely baffled by what to serve at your next dinner party, you aren’t alone. Whether red or white, dry or sweet, the options can be overwhelming. Two wine experts from The Art Institutes system of schools have teamed up to help you navigate the wine aisle like a pro. According to Chef Bernard and Chef Bradley Owen, a certified sommelier and instructor at The Art Institute of California – Orange County, a campus of Argosy University, you need to match the acidity, flavors and body of the wine to the dish with which it will be served. “The old adage of white wine with fish and red wine with meat is true and false,” he says. This will be true 80-90 percent of the time, but depending on how the dish is prepared, there are always ways to break this rule. He adds that chicken and pork are crossover proteins, which could work with whites or reds depending on preparation. Acidity is very important, and Owen explains that you want to match the acidity of the wine with the acidity of the dish. Fish prepared in a traditional way works well with white wine, but when prepared with something like mushrooms or with red wine influences, you can move to a lighter red. Filet mignon, typically served with a red wine, can be paired with a white when served with a salad with high-acidic vinaigrette. When matching flavors, Bernard recommends reading the back of the bottle. She says the same words that describe the wine should describe the food. For example, wines containing cherry flavors would go with something juicy such as a barbecue, since cherries are sweet and juicy. Strawberries are softer and would go with a more subtle dish, while black currants are more intense and would pair well with foods like venison, sausage or pepper steak. A simple way to remember this is the brighter the fruit on the label the lighter the food that goes with that wine, and the heavier or darker the fruits on the label the heavier the food. The body of the wine is the weight of the wine or the way it feels in your mouth. Owen says this body should also match the body of the food. Grapes have different body and richness based on the growing climate and decisions made by the wine makers. When looking to pair wine with meat, Owen recommends asking what you are pairing it with and what cut of meat is it. He says a rib eye with lots of fat, richness and flavor will need a wine with a rich body, such as cabernet sauvignon. A filet, which is less flavorful, could pair with a less full-bodied wine, such as a pinot noir. 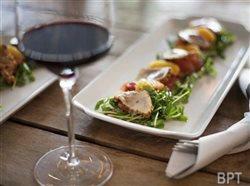 With red wines, tannins are a consideration when looking at food pairings. Tannins come from the grape skins and provide the natural astringency found in red wines. Bernard says heavy tannin wines go well with heavy proteins such as red meats.